Jeff Fritz, well known audiophile and passionate reviewer of high-end audio equipment for SoundStage! Network / UltraAudio.com, put our very own Anthem Statement M1 amplifiers to the test in his recently published review and in doing so, found himself overcoming biases. "So what to do with Anthem’s Statement M1 monaural amp? The thing weighs only about 20 pounds, and doesn’t even have a conventional power supply that I can admire -- it doesn’t even have top-panel vents to peer through. And yet it’s rated to deliver a mind-boggling 1000W into 8 ohms or 2000W into 4 ohms, which makes it, at least on paper, as powerful an amplifier as I have ever reviewed." "...the Anthem Statement M1 was like a ninja sneaking up in the night. At least initially, its most striking characteristic was what I didn’t hear... First, the M1 was quiet -- as quiet as most of the more accomplished amplifiers I’ve had in my system over the last few years... the M1s were right in there with the best of the rest, and at a fraction of the price." "... the M1s were right in there with the best... and at a fraction of the price." "If having a low noise floor is important to you, particularly so that you can hear low-level detail through revealing speakers, you should definitely audition the M1. I found that listening late at night was a joy through the Anthems, when quieter musical works were the order of business and lower listening levels were required." "The M1 was almost completely silent, in terms of both the noise audible through the tweeters and emanating from its chassis. In fact, you could place these amps right next to your listening chair, if you had to, and never notice them. That’s a great characteristic for a power amp, in my book, and maybe one big reason to avoid the huge transformers of traditional amplifiers." "What I eventually figured out was that the M1 could be a subterranean beast, but only when the music demanded it; it did not, by default, just sound "big" in the way some amplifiers can." "With small-scale music, the Anthem M1s sounded subtle and unassuming. But then, out of the blue, I’d play a bass-heavy track and ... here comes the boom! When I played large-scale music that demanded immense reserves of power, the M1s apparently did have physical impact, great low-frequency reach, and complete control of the Dynaudios’ woofers." "...the M1s had the kind of tight-fisted bass control, weight, depth, and slam that I’ve heard from the best 150-pound amps. I heard and felt bass rolling through my room that seemed to belie the smallish size of the Dynaudio woofers. I could feel the wallops in my chest, which I wasn’t expecting. The articulation in the lower registers was also impressive -- all I heard was clean, crisp whacks." "From the tonal perspective, there wasn’t really anything to criticize... The sound was clean and clear, but not scrubbed to the point that it ever sounded threadbare or lacking in tonal density. In that sense, the Anthem Statement M1 approached the theoretical ideal of the straight wire with gain. "The midrange was balanced nicely, allowing voices to come through with excellent intelligibility and with good focus within the soundstage... There was hardly anything to fault. These amplifiers did a workman’s job. Or, with 1000W on tap, the jobs of many workmen!" "... But what can't be denied is just how good the Anthem Statement M1s are." 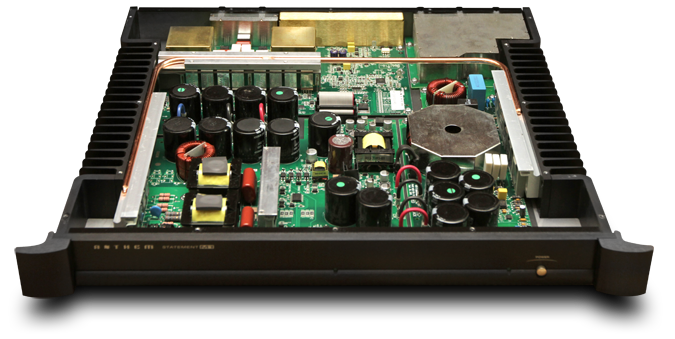 "The Anthem Statement M1 is an essentially neutral amplifier. 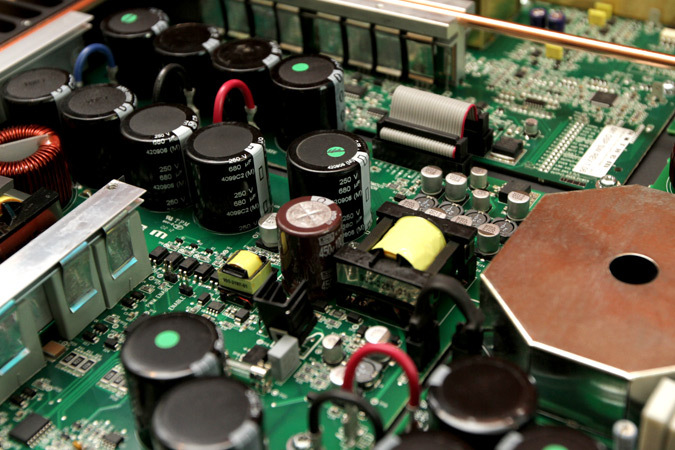 It doesn’t sound ruthlessly fast or microscopically resolving, and it doesn’t sound crazy big. Some amplifiers out there may have those characteristics and would be judged superior to the Anthems... But what can’t be denied is just how good the Anthem Statement M1s are. They won’t color your speakers, and they’ll likely drive any speaker you might ever choose. They have enough power to never be the limiting factor in your listening experience. "The question, then, is this: Is that enough for you? Do you need to see a huge chassis? Do you have an intrinsic desire to own an amplifier built like a Swiss watch, with bling galore and a price to match? Do you need to hear something that easily confirms your having made the "right" choice?" "Those aren’t easy questions to answer for those of us who’ve played in the stratosphere of the very best audio gear. What I can unequivocally say is that the Anthem Statement M1 is darn near the ideal of a straight wire with gain, and at 1000W, that gain is almost unlimited. Is that enough for you? I suspect that, for many listeners, the answer will be an emphatic yes." give Jeff's full review a read for more on his perspective. To visit the Anthem Statement M1 page on the Anthem website.